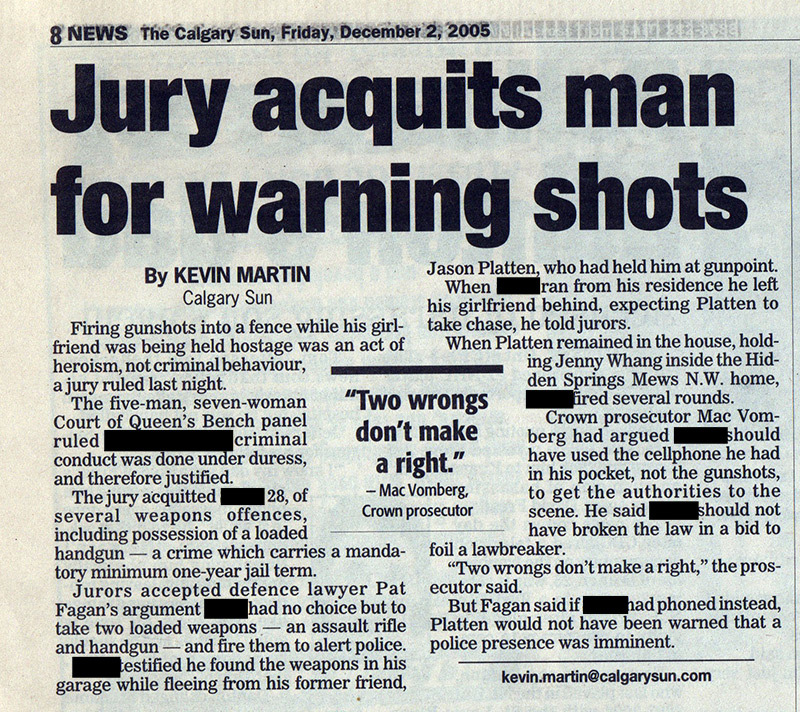 Jury acquits man for warning shots - Patrick C. Fagan, Q.C. Firing gunshots into a fence while his girlfriend was being held hostage was an act of heroism, not criminal behavior, a jury ruled last night. The five-man seven-woman Court of Queen’s Bench panel ruled the accused’s criminal conduct was done under duress, and therefore justified. The jury acquitted the accused, 28, of several weapons offences, including possession of a loaded handgun – a crime which carries a mandatory minimum of one-year jail term. Jurors accepted defence lawyer Pat Fagan’s argument the accused had no choice but to take two loaded weapons – an assault rifle and handgun – fire them to alert police. The accused testified he found the weapons in his garage while fleeing from his former friend Jason Platten, who had held him at gunpoint. When the accused ran from his residence he left his girlfriend behind, expecting Platten to take chase, he told jurors. When Platten remained in the hose, holding Jenny Whang inside the Hidden Springs Mews N.W. home, the accused fired several rounds. Crown prosecutor Mac Vomberg had argued the accused should have used the cellphone he had in his pocket, not the gunshots, to get the authorities to the scene. He said the accused should not have broken the law in a bid to foil lawbreaker. “Two wrongs don’t make a right,” the prosecutor said. But Fagan said if the accused had phone instead, Platten would not have been warned that a police presence was imminent.